There is no doubt that there has been a dramatic increase in the popularity of Hybrid and Electric vehicles over the last few years. At Blackshaws we have a wide range of Mitsubishi and Suzuki New and Used Hybrids and Used Nissan LEAF Electric vehicles to suit all driving requirements. To help you understand the different options that are available here is a list of some of the most frequently asked questions about Hybrid and Electric vehicle driving. Hybrids are vehicles that combine a conventional combustion engine (usually petrol) with an electric motor in order to maximise efficiency. In some ways a hybrid can be viewed as a stepping stone between a traditional vehicle powered solely by fossil-fuel (petrol or diesel) and a 100% electric vehicle. What are the advantages of hybrids? The main advantages of hybrids are that they consume less fuel and emit lower CO2 emissions than conventional vehicles. Hybrids also have lower first year road tax and lower company car tax, therefore they are generally cheaper to run. In addition, as hybrids have a combustion engine to fall back on, electric range anxiety isn’t an issue. Are there different types of hybrid? Hybrids can be categorised into self-charging or plug-in depending on the amount of battery power they have and whether the vehicle can drive under battery power alone. A self-charging or mild hybrid vehicle is one which can’t drive under electric power alone. Instead, the battery is used to assist the engine resulting in greater fuel efficiency. During deceleration or coasting, wasted power is harvested and then used to recharge the battery. One of the advantages of self-charging hybrids is the light and compact size of the battery which means there is no reduction in interior space or in the agility of the vehicle. In addition, self-charging hybrids do not need to be plugged into an electric source as the battery recharging takes place while the car is on the move. By the end of 2019 all vehicles in the Suzuki range will have self-charging hybrid engines. 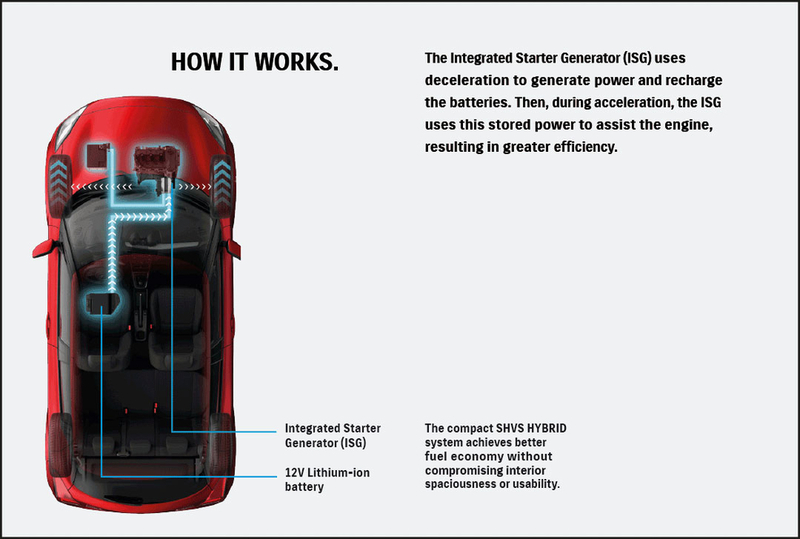 Please refer to the image and video below for more information about the Suzuki self-charging hybrid engine. A plug-in or strong hybrid is much closer to a full electric vehicle and can drive under its own electric power. As the name suggests, the batteries in a plug-in hybrid can be recharged from an electric point and this means the vehicle can travel much further under electric power alone, usually around 30 to 40 miles. Once the battery charge falls or if more power is needed the combustion engine kicks in automatically and acts as a generator for the battery. A plug-in hybrid is an ideal choice if you are able to charge your car at home or work and have a commute of 30 miles or less. If this is the case you’ll be able to drive on electricity for most of the time but with the knowledge that the petrol engine is there if needed. The Mitsubishi Outlander PHEV is the UK’s best-selling plug-in hybrid vehicle. At Blackshaws we have a wide selection of new and used Outlander PHEVs so please click on the buttons below if you’d like more information. An electric vehicle is one that is powered solely by an electric battery. This means it has no oil, no petrol tank, no gear box and no exhaust pipe. Electric vehicles produce zero CO2 emissions and are therefore the most environmentally friendly cars you can buy with no road tax costs if priced below £40,000. Driving an electric vehicle is very similar to driving an automatic vehicle with very rapid acceleration. There is a myth that an electric car will be slow or sluggish but actually the opposite is true. As there are no gears you get 100% torque which means the car is quick, smooth and responsive. What are the main benefits of electric vehicles? There are numerous benefits to owning an electric vehicle. In financial terms the running costs are significantly lower than either petrol or diesel vehicles as there are no fuel costs to pay. Electric vehicle drivers are also exempt from Vehicle Excise Duty (if their vehicle cost below £40,000), company car tax and the London congestion charge. Electric vehicles are environmentally friendly, very quiet to drive and as there are fewer moving parts maintenance costs are also significantly reduced. An electric car such as the Nissan LEAF will cost approximately 2-4p per mile to run compared to equivalent petrol or diesel cars that cost up to 10 times that amount. The range of an electric vehicle varies from model to model and it is increasing all the time as battery technology improves. For example, the latest Nissan LEAF has a range of up to 177 miles. There are a number of options for re-charging an electric vehicle. Firstly they can be charged at your home in a standard domestic 3 pin socket and typically drivers choose to do this overnight. Alternatively you can elect to have a special Home Charging Unit installed at your home to reduce the charge time. In addition there are many rapid charge points all over the country which provide an 80% charge in about 45 minutes. The actual process of re-charging is very simple - all you have to do is plug your vehicle into the charge point using the cable that is provided with the car or the cable attached to your Home Charging Unit. The Nissan LEAF was the world’s first affordable, mass produced 100% electric vehicle. At Blackshaws we have a selection of Used Nissan LEAF vehicles for sale. Please click on the link below to find out more. If you would like more information on Hybrid or Electric vehicles please contact Blackshaws Sales Team on Alnwick 01665 602202 or Morpeth 01670 719478.